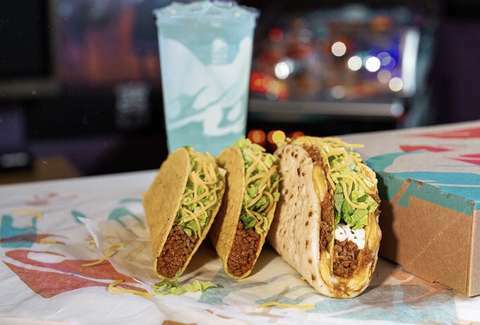 Taco Bell's Double Cheesy Gordita Crunch Is Finally Back. And It's Big. Earlier this month, it was announced that Nacho Fries would make their triumphant return to Taco Bell. That was great news, and cause for celebration for sure, but it's been announced that another of Taco Bell's culinary innovations is making its way back to the public. So, now it's time to be excited about that one. Sorry, we don't make the rules. The Double Cheesy Gordita Crunch is back at Taco Bell for a limited time, according to the chain. It is large. It is both Cheesy and Gordita-y. If you're wondering what in the name of ground beef this thing is, well, it's pretty much what it sounds like. It's the original taco-like thing, with a second serving of beef, in addition to the melted cheese, flatbread, and crunchy taco shell you've come to know and love and fear. Brand Eating reports that the suggested price of the Double Cheesy Gordita Crunch is $3.49, whereas the original costs $3.39 -- so you can't afford not to order these until beef runs in your veins like blood. That's especially true when you consider that you can get it as part of a $5 Box combo, which will get you one, plus two crunchy tacos, a medium fountain drink. And if you're not in the mood for more tacos, you could always get a side of Nacho Fries. It's your life.